Omar, I am half way through my 3 month herb cleanse. Since its for maintenance parasite eradication I figured that most are gone, however I decided to incorporate Freedom and Restore into my own healing methodology. In my program I intensely drive any healing products deep into my body and tissues and then back out through the detox channels. So I take Feedom and Restore - 2 of each first thing in the morning and have some fresh juice and after about 20 minutes I go for a 5 mile or more run. I can still do the distance in less than an hour and sweat like mad, so all of the constituents are driven fully through my body. I have done it three times now and had fantastic results. All I can say is you have a wonderful formula, I love it! I have suffered with horrible GI symptoms since 2001. i thought i had tried everything over those 11 years. i have been taking your treatment for 2 1/2 weeks and have had more relief than anything has given me yet. almost have a normal life again. if things continue to improve as they have this far, i will be normal again. and for that i can never, ever thank you enough. If you need more details... I had seafood one day and came home very ill, was treated with multiple antibiotics, sent dozens of stool specimens (all negative), have seen 17 doctors/specialists over the last 11 years who all gave up (including 2 from the Cleveland Clinic). Tried many diets, futile bowel treatments, and various anti-parasitics. Some days I just prayed to die. It amazes me how many doctors refuse to acknowledge the reality of parasites. Most of them laughed at me when I asked about the possibility. I knew I would never get better if I stayed with my local doctors and labs. Your lab was the only one in 11 yrs to find a parasite. I thank you so much for the improvement I feel after just 2 1/2 weeks. For the last 4 years I have been battling a strange pain in my lower abdomen and bladder. I was diagnosised with IC (Interstital Cystitis- where the inner lining of my bladder becomes inflammed) by my gynocologist about 3 years ago. According to my doctor, they don't know the cause and place it in the auto immune category, and was prescribed a blood thinner known as Elmiron. The cost of the drug without insurance is $300.00 a month with horrible side effects. I tried it for 1 month and saw no changes. I have a degree in Exercise Science and have learned through my studies that the body has a natural ability to heal itself if you find the root cause. As time went on my gut became more and more painful. I saw 3 different doctors. I was told I had fibromyalgia and to take Cymbalta. I knew my symptoms were not congruent with everything I had read about fibromyalgia. I went back and looked at my blood work, my cbc had a high reading of eosinophils. I learned there are 3 reasons for a high eosinophil reading: a rare blood disease, infection or a parasitic infection. So I started researching symptoms associated with a parasitic infection, sure enough I had 9 out of 12. Everything that you read about in regards to a parasitic infection tells you that you have to go a foreign country to "pick up parasites", I am living proof that you don't. I have never left this country! My symptoms: severe burning in my intestines and bladder, chronic constipation, BLOATING, spleen enlargement, foggy thinking, insomnia from 1am until 5 am, muscle pain, muscle stiffness, i had stopped dreaming, bad breath, a bad odor from my lungs, fatigue. Heavy menstral bleeding( 2x a month), a poor mental attitude, anxiety. I went to my local health store and bought a parasite cleanse. In as little as 2 days, I felt a difference. I took the product for 2 months with some success, but not a complete removal of all symptoms. I tried another parasitic supplement with little results. I had heard of Dr Omar Amin, from my naturopathic doctor. I thought he is the expert in this field, his product might be better. It was! After taking the first dose, I passed some parasites that I had never seen before. His supplements gave me my life back. I have taken his supplements full strength for 2 months and it finally seems that I am getting a grip on these free loaders. I also want to add that I tried the traditional parasitic drugs that you get prescribed from your doctor such as mebendazole and another antihemolytic with no results, it was as if they weren't even phased by the heavy duty drug!! The herbs in this supplement wreck havoc on the parasites. You will see the results, (pun intended) Follow the protocol..... After all if you don't have your health, what do you have? 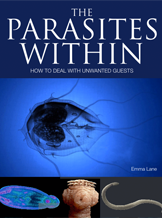 Before using your product, I had problems with parasites for around two years. Other products on the market helped but were not totally clearing up the problem. After 6 weeks on your parasite cleanse, there has been the beginnings of a big improvement. I was troubled by a continual bladder infection that was caused by parasites. I didn't realize that it was the parasites causing this until I started using your product. What the other products on the market out there couldn't do, yours did I will continue on your cleans and do whatever it takes to get free from this disastrous situation. Thank you so much for all your hard work and for any trials that I can imagine that you might have gone through to make this product and get it on the market. I am eternally grateful to you, a wonderful person who has dedicated his life to help humanity in such a compassionate way. May many, many blessing return to you. I would like to personally say thank you for everything that you do to help society rid themselves of nasty critters and restore balance to the human body. I am blessed to have been able to hear of your product through Shawn Bean (from Dr. Overbeck's office in Pennsylvania)I believe I spoke with you over the phone when I had a few questions regarding your product. I am the Veteran of Operation Enduring Freedom and Operation Iraqi Freedom who was exposed to the desert and the food from Iraq/Kuwait. Thank you again for your knowledge and the blessing you give to people of the world to give them another chance at life through your product.